Mrs. Phyllis Isabelle Leatherman, age 96, passed away Thursday, May 31, 2018. She was born in Chicago, Illinois on October 27, 1921 to William & Phyllis (Budgick) Styx and married Vernon Leatherman in 1943. 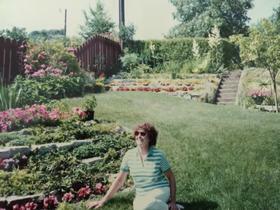 She was a loving wife and mother who enjoyed gardening and dancing. Daughter, Gale Larson; grandson, Scott Regelin-Larson; brother, Donald (Elizabeth) Styx; many nieces, nephews & cousins. She was preceded in death by her husband, Vernon and sister, Beatrice Rogalski. A celebration of Phyllis' life will be held Saturday, June 23, 2018 from 4:00 pm until whenever, 305 Sherman Ave. Grand Haven.